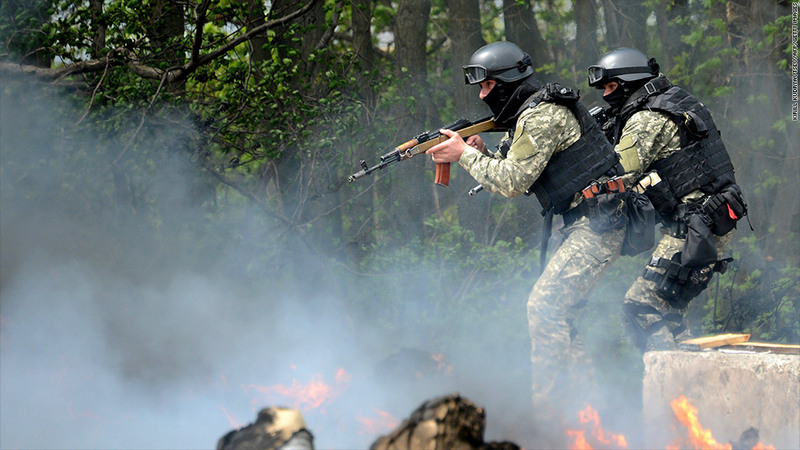 Ukrainian special forces have been active in the eastern Ukrainian city of Slavyansk, where five militants were killed. Russia has vowed there will be consequences for these actions. Russia's stock market and currency tumbled Thursday as investors and traders worry about an intensifying standoff in eastern Ukraine. Ukrainian forces killed five militants during an operation aimed at taking down pro-Russian roadblocks in eastern Ukraine, prompting Russia's defense minister to tell a state news agency that Russia will begin military drills at the Ukrainian border. Russian President Vladimir Putin said Ukraine's use of armed forces will result in consequences, calling the military operation a "very serious crime", according to Russian state TV. Russia's benchmark Micex index, which had been ticking higher, quickly fell into the red and continued pushing lower in afternoon trading. The Russian index has fallen by 13.5% since the start of the year, as investors worry about the cost of a full-fledged military confrontation. Meanwhile, U.S. and European sanctions are putting pressure on the weakening Russian economy and sapping investor confidence. The Russian ruble also took a hit Thursday, edging down by 0.2%. The currency has declined by roughly 8% since the start of the year. Ukraine and western countries maintain that Russia is trying to destabilize parts of eastern Ukraine. That's prompted limited sanctions against Russia, with threats of more to come. Russian officials have denied that they are working to aggravate separatist sentiment. Last month, Russia took control of Ukraine's Crimea region, a move considered illegal by many in the international community. Markets in Europe also reacted to the rising tensions. Germany's stock market fell sharply before staging a modest recovery. Germany has a massive trade relationship with Russia -- worth over €76 billion ($105 billion) last year -- and if European leaders opt to introduce further sanctions against Russia, that could hit Germany's economy. More than 6,000 German companies do business with Russia. Germany also relies on Russia for nearly half of its natural gas, and concerns are rising that Russia may taper its gas supplies to Europe.